River Number Two village beach, a community-run resort is located in the Penninsula region of Western Sierra Leone, about 1h drive south of Freetown. In the late 18th and early 19th century the region around Freetown was used by the British to 'resettle' freed slaves, London's "Black Poor", and many African American refugees from the American Revolution. Sierra Leone was since 1808 a British Crown Colony, the country gained independence in 1961. Today it is the poorest nation in the Commonwealth. With an area of 71,740 km² the country is just slightly larger than Ireland or slightly smaller than the U.S. state of South Carolina. The country's landscape offers a flat coastal belt, the eastern half of the nation is covered by hills and high mountains, part of the Guinea highlands, Mount Bintumani (1,948 m (6,391 ft)) within the Loma mountains in Koinadugu (Northern Province) is the highest peak in the country. Main rivers are the Tai river, the Sewa (Sew), and the Moa River. Sierra Leone has a population of 7 million people (census 2015), its largest city, chief port and capital is Freetown, the city is situated in north west of the country at the coast of the North Atlantic Ocean. Spoken languages are English (official), English Creole, Temne, Mende and other West African languages. Islam (78%) and Christianity (21%) are the two main religions in the country. Sierra Leone lies within Africa's tropical zone, with a climate that offers two seasons, the rainy season from May to December, and a dry season from December to May. The 1991 to 2002 civil war between the government and the Revolutionary United Front (RUF) resulted in tens of thousands of deaths and the displacement of more than 2 million people (about one-third of the population), many of whom are now refugees in neighboring countries. With the support of the UN peacekeeping force and contributions from the World Bank and international community, demobilization and disarmament of the RUF and Civil Defense Forces (CDF) combatants has been completed. National elections were held in May 2002 and the government continues to slowly reestablish its authority. However, the gradual withdrawal of most UN Mission in Sierra Leone (UNAMSIL) peacekeepers in 2004 and early 2005, deteriorating political and economic conditions in Guinea, and the tenuous security situation in neighboring Liberia challenged the continuation of Sierra Leone's stability. In March 2014, the closure of the UN Integrated Peacebuilding Office in Sierra Leone marked the end of more than 15 years of peacekeeping in the country. Type: Republic with a democratically elected President and Parliament. Independence: 27 April 1961 (from Britain). 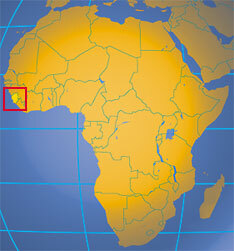 Location: Western Africa, bordering the North Atlantic Ocean, between Guinea and Liberia. Terrain: Three areas are coastal belt of mangrove swamps, wooded hills along the immediate interior, and a mountainous plateau in the interior. Ethnic groups: Temne 30%, Mende 30%, Krio 1%, small Lebanese community. Religions: Muslim 60%, Christian 30%, animist 10%. Languages: English (official, regular use limited to literate minority), Krio, Temne, Mende, and 15 other indigenous languages. Natural resources: Diamonds, gold, titanium, bauxite, iron ore, chromite. Agriculture products: Rice, coffee, cocoa, palm kernels, palm oil, peanuts; poultry, cattle, sheep, pigs; fish. Industries: Diamonds mining; small-scale manufacturing (beverages, textiles, cigarettes, footwear); petroleum refining. Exports - commodities: Iron ore, diamonds, rutile, cocoa, coffee, fish. Imports - commodities: foodstuffs, machinery and equipment, fuels and lubricants, chemicals. 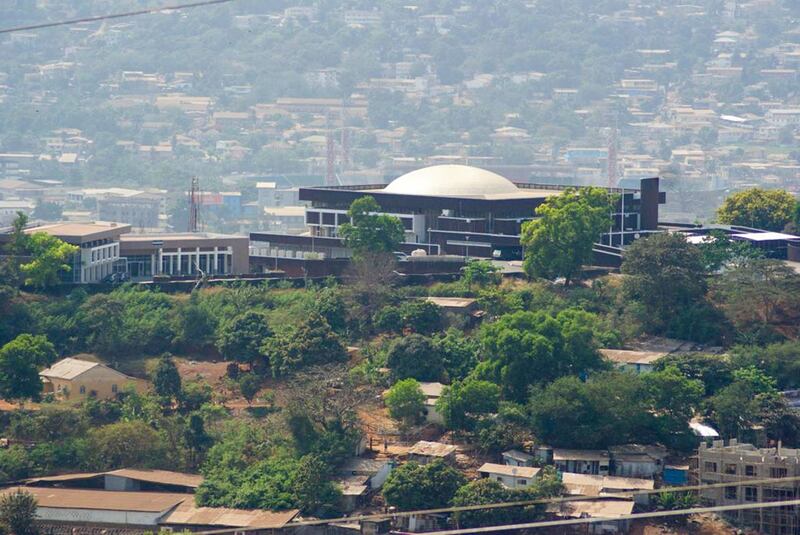 Sierra Leone's Parliament building on Tower Hill in Freetown, the capital city of the country. The building was constructed with the help of Israel in the early 1960s, a reflection of Israel’s long-running engagement in Africa. The Government of Sierra Leone online, the site provides also related news. Official website of the Ministry of Foreign Affairs and International Cooperation (MFAIC) of the Republic of Sierra Leone. Official website of the Mission of Sierra Leone to the United Nations in New York (under construction). Political map of Sierra Leone. Map showing Sierra Leone's administrative regions. Searchable map/satellite view of Sierra Leone. Searchable map/satellite view of Sierra Leone' capital city. All 54 countries of Africa. A Relief Map of Africa. Set up jointly by the Government of Sierra Leone and the United Nations. It is mandated to try those who bear the greatest responsibility for serious violations of international humanitarian law and Sierra Leonean law committed in the territory of Sierra Leone since 30 November 1996. More information about a decade of armed conflict and grotesque human rights violations in Sierra Leone. Diamonds were central to the conflict in Sierra Leone, and that a highly criminalized war economy had developed a momentum of its own. The Lome Peace Agreement of July 1999 sought to bring an end to one of the most brutal civil wars of recent times. Recent news from Sierra Leone. Sierra Leone news produced in the US. Articles related to Sierra Leone. UN press agency with the latest news from Sierra Leone. Radio Democracy New England Ville in freetown, a non-profit organization that operates as an independent news media corporation,. Talking Drum Studios (TDS), multi-media studios with multi-ethnic teams of journalists and producers, to stimulate national dialogue around critical issues. Showcases some of Sierra Leone's artists on youtube. 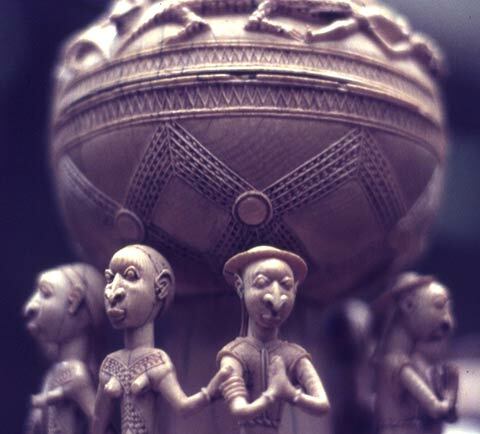 15th, 16th century carved ivory from West Africa. 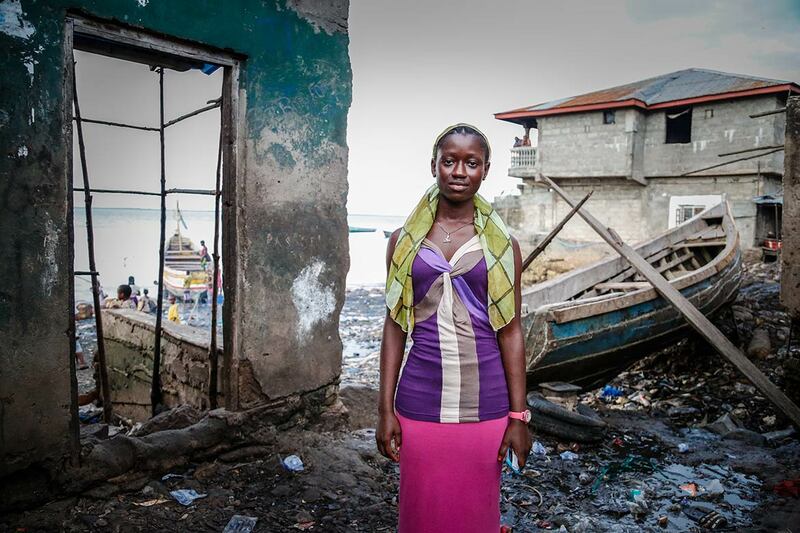 "Now I want to be a doctor" Celina Kamanda, Ebola survivor in Freetown. 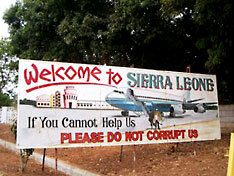 There are seven regional airports in Sierra Leone (unpaved), and one international airport in Freetown. Transport within the country depends on a 11,300 km road network, just 8% are paved, most of them in poor repair; in the rainy season cross-country roads are often impassable. Sierra Leone's railway system (nearly 600 km in length) from Freetown through Bo to Kenema and Daru, with a branch to Makeni in the Northern Province, closed in 1974. Sierra Leone's international airport is served by KLM, Air France, Brussels Airlines, and Mauritania Airlines from Dakar via Conakry. Sierra National Airlines was the national airline of Sierra Leone from 1990 until 2006 when it ceased operations. FLA was a UK based carrier with direct flights between Freetown and London Gatwick. Fly Salone was an airline based in the United Kingdom that operated scheduled and charter flights between London and Freetown using Icelandair aircraft. 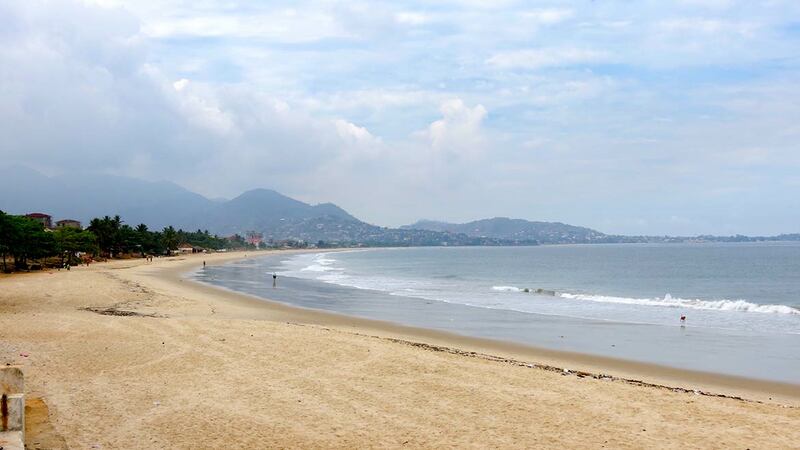 Beach at Freetown with Freetown Peninsula and Lion Mountains in the background. Banana Islands (beaches and a prime tourist destination south west of the Freetown Peninsula); Tiwai Island (an inland river island in the Moa River in the Upper Guinea Rainforest area of the Southern Province, a community conservation wildlife sanctuary, it is on the tentative list of UNESCO); Bunce Island (castle of a British slave-trading company on the island in the Sierra Leone River near Freetown); National Railway Museum (the country has no railway anymore but a railway museum in Freetown); Lake Sonfon (holy fresh water mountain lake); Outamba-Kilimi National Park (Sierra Leone's first National Park near the border with Guinea); Mamunta Mayosso Wildlife Sanctuary (game reserve in Tonkolili District, Northern Province). Provides visitors information and Sierra Leone tourism industry facts and addresses. Sierra Leone portal, a very comprehensive website with a lot of information on Sierra Leone. US based Sierra Leone community website. Travel and tourism information as well as news from Sierra Leone. Pre-war images of Sierra Leone taken between 1987 and 1990 by Glenn Elert. Primary Education in Sierra Leone - Girls at school in Sierra Leone. The public institution operates on two campuses, in Bo and Njala. 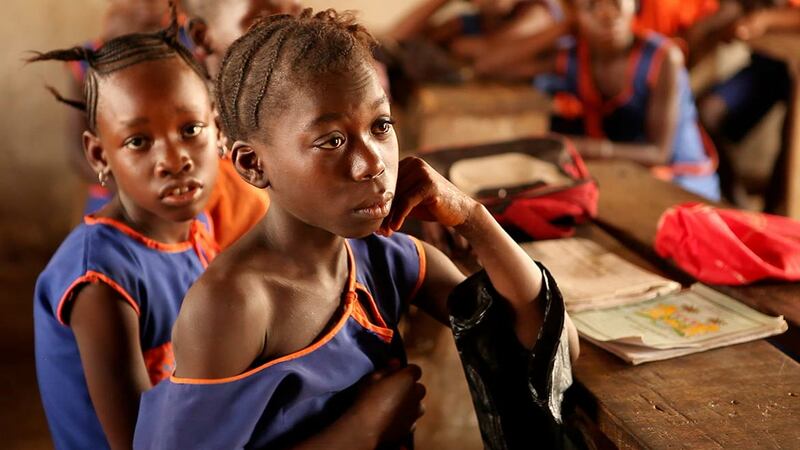 Data and information about Sierra Leone's educational system. 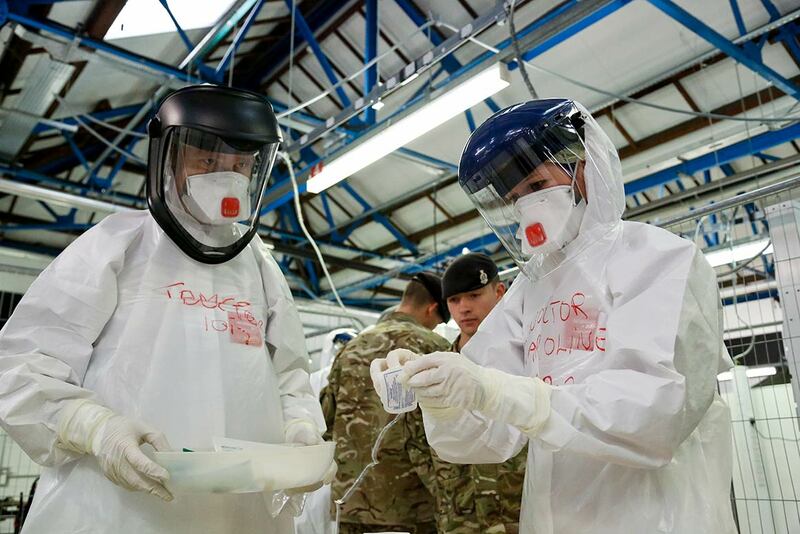 NHS doctors and nurses practise their medical skills at the Army's Ebola training facility. Sierra Leone and neighboring countries were hit by an Ebola outbreak in 2014 that eventually outpaced all others. Natural hazards in the country are the dry, sand-laden harmattan winds from the Sahara (December to February). A rapid population growth pressuring the environment; overharvesting of timber, expansion of cattle grazing, and slash-and-burn agriculture have resulted in deforestation and soil exhaustion; the civil war has depleted much of the natural resources. This paper details Geza Teleki's contributions in the development of a wildlife conservation movement in Sierra Leone in the late 1970s. From Sierra Leone's early history until modern and post-modern history. Overview of Sierra Leone's History by Wikipedia. Online history book of "Fifty Great Men and Women Who Helped to Build Our Nation". Website about Sorious Samura's film "Cry Freetown", a brutal portrayal of what happened in Freetown, capital of Sierra Leone in January 1999. An African American woman from Charleston, South Carolina, will make an historic homecoming visit to the West African nation of Sierra Leone.